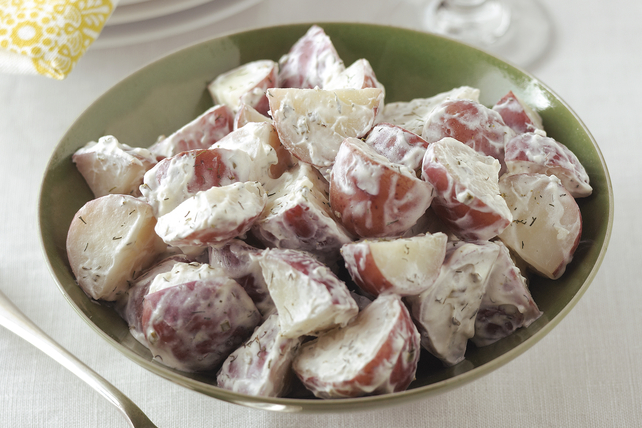 PHILADELPHIA Dill Cream Cheese Product makes a simple sauce for farm-fresh new potatoes. Goodbye boring old potatoes…hello creamy potato side dish! Cook potatoes in boiling water in large saucepan 12 min. or just until potatoes are tender. Drain; return potatoes to pan. Add remaining ingredients; cook on low heat 1 min. or until cream cheese product is melted and potatoes are evenly coated with sauce, stirring constantly. Sprinkle with 1 Tbsp. chopped fresh parsley just before serving.